China's Hidden Economy Of Graft Undermines State Behind China's complicated economy exists a vast underground economy of corruption and bribery. A recent case in which an anti-corruption official was convicted of taking bribes -- and now awaits execution -- shows how endemic and open a secret the problem is. In southern China, a local Communist Party official is awaiting execution -- convicted of exactly the kind of corruption he was supposed to fight. 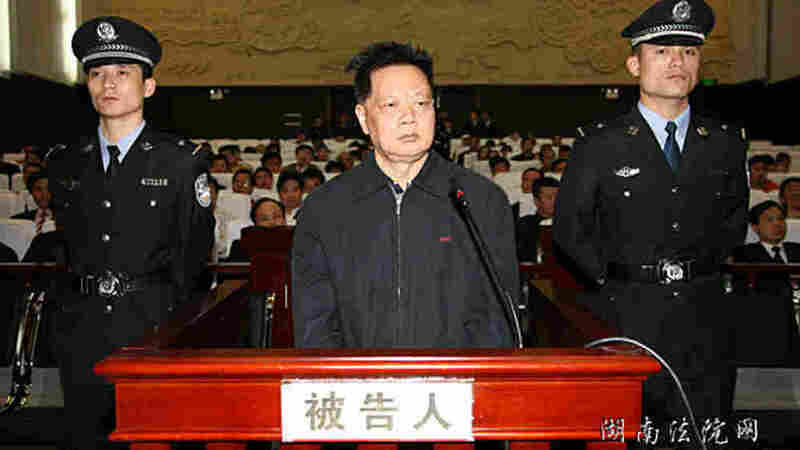 Zeng Jinchun wasn't a very high-ranking watchdog, but the amount of money he embezzled and the difficulty of bringing him to justice have attracted attention in China. And this kind of corruption scandal has been repeated in other cities across China in recent years. The scene of the scandal is Chenzhou, a city in Hunan province. Some 900 years ago, when the great poet Su Dongpo was exiled there, it was a wild and remote land. Today, it is a bustling coal-mining town on the railroad between Beijing and Hong Kong. In September 2006, Chenzhou residents set off fireworks to celebrate the detention of Zeng, the corruption watchdog, along with the mayor and many other municipal officials. Zeng's job gave him the power to detain Communist Party members for investigation. He used this power to extort money and punish anyone who gave him trouble. That's what happened to Hu Songcai, the head of a county construction bureau. Zeng ordered Hu to give a construction project to a certain work crew foreman, but Hu refused, saying the job had to go through a public bidding process, as required by Chinese law. Hu says Zeng had him detained for 100 days. "The officials who investigated my case said, 'You didn't go over and pay your respects to our boss,' " Hu recalls. " 'Now you've ended up in a sorry state. This time we're going to take your job and your money.' "
Many Chenzhou merchants decided it was best to purchase a bronze plaque from Zeng and hang it outside their business. The plaque said that the merchant was protected by the anti-corruption authorities. Businessman Li Minzhu says he was detained three times for failing to buy a plaque, or in other words, for failing to pay Zeng protection money. "The average payment for protection money was around $60,000," Li says. "But it depended on the size of your business. If you made a lot of money, you might pay more; if you made less, you might pay less." A city assemblyman's position goes for $44,000. These prices are well-known to residents.They're an open secret. Zeng employed scores of "basket carriers," relatives and lackeys tasked with negotiating and collecting bribes from local coal mine operators and entrepreneurs. If that didn't work, Zeng had a gang of enforcers who would assault or terrorize anyone who dared to cross him. Zeng also made money from selling official positions. Huang Yuanxun is a local farmer who led efforts to expose Zeng. "In my hometown, a county assemblyman's position goes for more than $22,000," he says matter-of-factly. "A city assemblyman's position goes for $44,000. These prices are well-known to residents. They're an open secret." Huang says businessmen buy official positions to protect their businesses, and then engage in corruption to recoup the cost of the position. Luo Changping is a Beijing-based reporter and author of a recent book about the Chenzhou corruption scandal. He interviewed Zeng three times and wrote critical reports on him. Luo describes Zeng as a heavy-set, raspy-voiced man whose office door, unlike those of his colleagues, was always open. "Zeng Jinchun wasn't afraid of talking about anything with you. He had no scruples," Luo says. "One reason for this was his straightforward character. Another may have been his confidence in his own power. He felt he had the protection of higher-ups, so he didn't fear most reporters or other watchdogs." One of the hidden rules of Chinese officialdom is that many officials use the bribes they take to, in turn, bribe officials above them for protection. That kind of corruption is usually dealt with secretly within the Communist Party. It's seldom mentioned in court. Prosecutors accused Zeng only of taking bribes, not giving them. But journalist Luo is certain that Zeng bought off anti-corruption officials at the provincial and national levels. And this helped him to fend off three investigations for graft. "This is a rule everyone knows," Luo argues. "Officials, especially high-ranking ones, are basically not held accountable for paying bribes. This is because China's judiciary is not independent enough." In the end, China's highest leader issued instructions for Zeng's arrest much as Chinese emperors before him issued instructions. President Hu Jintao took a classified report on Zeng, prepared for him by the official Xinhua News Agency, and scribbled a note in the margins. Huang, the farmer who worked to expose Zeng, saw the note. He said it read: "To Comrade Wu Guanzheng: Put more effort into investigating corruption in Chenzhou. Signed, Hu Jintao, July 19, 2006." Officials, especially high-ranking ones, are basically not held accountable for paying bribes. Wu was China's top anti-corruption official at the time. The note didn't explicitly say to arrest Zeng, but its meaning was clear to officials. "The fact that it took the highest official in the land to bring about the investigation of a local official means that the party lacks even the most basic system of oversight," Luo, the journalist, says. "The downfall of such an official contains many elements of chance. It wasn't necessarily a sure thing." Chenzhou locals say that corruption in their municipal government was too endemic to be cleaned out easily, and corrupt officials still in power continue to make life difficult for them. Zeng was only the most colorful of the Chenzhou officials to fall. But many other officials had similar rackets going on. Most built political factions staffed with college classmates, army buddies and fellow hometown residents. And they cemented these alliances with bribes. During his 11 years in power, Zeng and his family reportedly amassed $48 million worth of bribes and other illegal wealth. That's about one-tenth of the Chenzhou government's fiscal revenues in 2006. Many locals believe Zeng's stash was even bigger. Locals nicknamed Zeng "a modern-day He Shen," after a famously corrupt 18th-century Manchu official. Authorities searching He Shen's home after his arrest are said to have found a fortune equal to 10 times the imperial treasury's annual revenues. That would have made him one of the world's wealthiest men at the time. Wu Si, Beijing-based journalist and the author of the book Hidden Rules, says that China's hidden rules create a vast underground economy of corruption. "To use a metaphor, money flowing legitimately into the state treasury looks like tributaries entering the Yangtze River and then flowing into the sea," Wu says. "But then we discover another sea next to it that is 10 times bigger but with no visible river flowing into it." Wu says that all this money, flowing from individual citizens into the pockets of a powerful few, has helped to undermine some seemingly invincible dynasties during China's long history. "If you look at the official rules of China's empires, you'd think they could last for ages, or be permanent," he says. "How could they collapse? But they collapsed just about every 200 years. It had a lot to do with these underground channels of plundered wealth," Wu says. Wu says it's hard enough describing China's known rules and its visible economy. Perceiving its hidden rules and its invisible economy is a much harder task, he says. But those who can discern these hidden workings see a major connection between China's past and its present.